I fell in love with the Shatter Me books at page one. Tahereh Mafi's writing is just so beautiful and it puts words to feelings that so many people have. I loved watching Juliette grow throughout the series by gaining independence and acceptance for who she is. The supporting characters are total standouts, this series definitely has one of my all time favorite cast of supporting characters. I love how through the two novellas, Destory Me and Fracture Me, you can experience Warner and Adam's voices and stories. The plot is the perfect pace with the right about of unexpected twists and turns. I love how Mafi has you question first impressions and challenges you to reevaluate the way you look at yourself through Juliette's character. 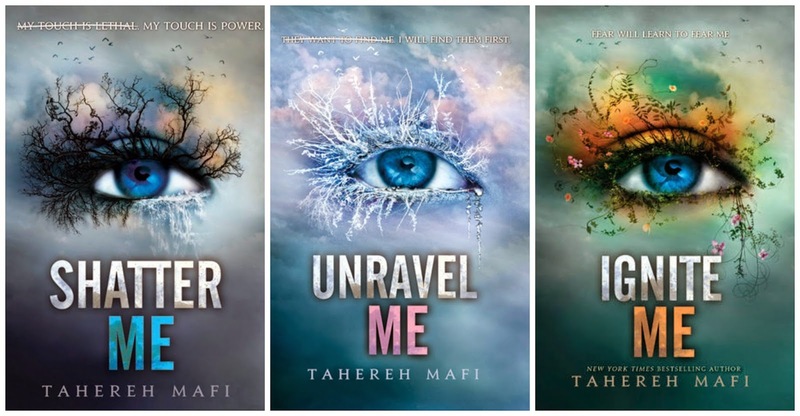 I'm obsessed with this series and can't wait for Tahereh Mafi's next book! I want to read this one but it's a SERIES which annoys me.. I miss reading stand alone novels - The covers are all STUNNING though so let's see, the premise sounds exciting. Glad you enjoyed them! I totally get what you mean about how so many books are in a series! I definitely love this one thought, I totally recommend it! :D Thank you! Ive only read the first book in the series and own all the books in it. I really need to catch up. I loved book one and Ive heard that it unfolds really well. Really cool post. I liked your breakdown of everything! I still need to read this series, but I plan to sometime! I know a lot of people weren't able to get into her writing style, but I have a feeling I'd be like you and totally fall in love with it immediately. Love the makeup of this post! I hope you love it and her writing style!